Studio Packages allow you to sell a set of products and/or services in one handy package. Services can then be redeemed over a period of time, making it easy to track how many products or services a client has left in their Package. So lets get started! Go to your Admin page, and select your Vouchers & Packages tab. Click New in your Packages section. On the right side panel, let's fill in the Package details. Give your package a name and a price. If you have set up your Loyalty Program, enter the number of Loyalty Points the client will receive when the purchase this package. Assign a Barcode (if applicable). 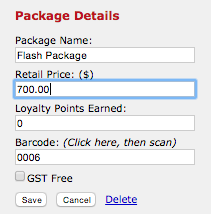 If you don't wish to include GST in the package price, you can tick GST Free. In most cases, this is irrelevant, therefore leave it un-ticked. If you're ready to move on, hit Next. 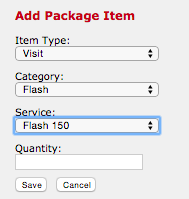 Add items (Services / Products) to your Package. The next step is to add the different items (Services and/or Products) to the Package. On the left hand side under the heading Add Package Item, simply select the Item Type: (Visit or Product) via the drop down menu. For the Visit item type (services), fill in the different fields (Item Type, Category, Service, Quantity) then Save. For Product choose the Item Type, Brand, Product, Quantity, and Save. You can continue to add new items until you have created your desired package, which might look something like this. Selling your packages to clients. Check out the Selling Studio Packages and booking clients in for their pre-paid services article for steps on how your clients can purchase your packages, and how they can redeem and book in for their pre-paid items.